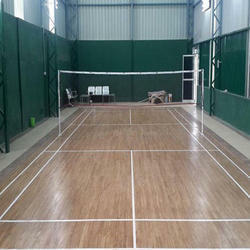 We are a leading Manufacturer of wooden badminton court flooring, badminton court flooring, indoor wooden badminton court flooring, indoor badminton court wooden flooring, badminton court wooden flooring and badminton court wood flooring from Mumbai, India. 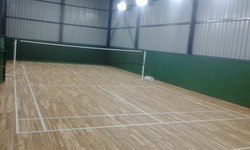 We are well known manufacturer of the best range of Laminated Wooden Badminton Court Flooring that is used for flooring in badminton court. 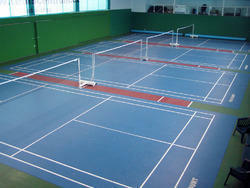 Customers can avail a fascinating array of Badminton Court Flooring from us at the most affordable prices. These floorings are precisely designed and developed by making use of quality assured woods and sophisticated technology. The net posts are placed over the doubles sidelines, even when singles is played. After completion of the civil construction, we undertake to lay out the Asian Air-Cush Wooden Flooring System wherein we use kiln dried FSC certified imported oak, teak, maple or beech wood surface board and the base frame of imported fir, spruce or pine wood. The bona anti-skid polish coatings used in is certified. We also undertake civil construction and lighting requirements. All other accessories related to the arena are also available to us. 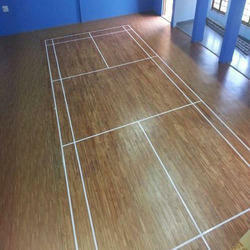 Wooden Badminton Court Flooring can be prepared in different cushion thickness suiting budget of the clients and level of the players. Also, we undertake all the civil construction jobs and all lightning work as per clients’ requirements. 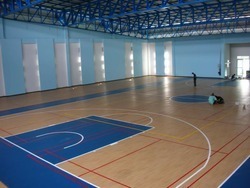 As a quality-oriented organization, we are focused to provide our clients an excellent quality Indoor Badminton Court Wooden Flooring. 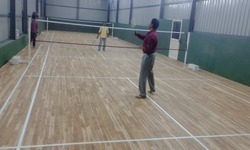 Badminton Court Wooden Floorings are fabricated from the optimum quality factor inputs which are sourced from the reliable vendors of the industry. 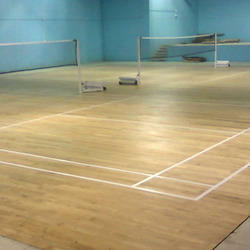 Badminton Court Wood Flooring ensures that there is no impact on the knees, feet, shins and ankles. A number of medical studies on athletes, both in India and internationally have revealed that surface elastic flooring induces a far smaller number of sports related injuries. 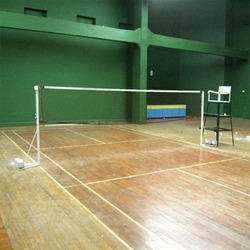 Our organization is dedicated to offering supreme quality Indoor Badminton Court Flooring. We design this sports flooring in several attractive and elegant designs, further, this can be customized as per the needs of our clients. 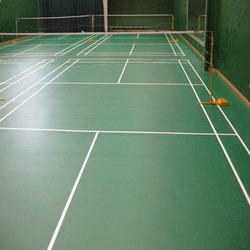 We are offering an optimal quality of Badminton Court Flooring. These are developed utilizing superior-grade basic material and advanced grade machinery beneath the command of trained professionals. Accessible to us in a plethora of stipulations, these are highly demanded. 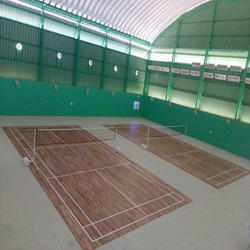 The free floating resilient wooden sports flooring system designed for, Badminton Teak Wood Flooring of Indian and imported timbers. 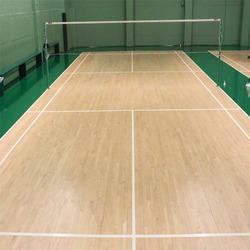 Looking for “Badminton Court Flooring”?